The new rules of engagement. Students will give you access to their notification bar which sees much higher engagement than email; but you must adhere to their strict expectations. The below graphic visualizes why push notifications are beginning to see more widespread use for more personalized, impactful communications for students. As you can see, email notifications can easily get lost in the noise whereas a targeted push notification offers greater relevance, brandability, and urgency. The shortcoming of email as a method of student engagement is no secret. A 2016 survey revealed that 39% of students don’t always open emails from their academic advisors, 50% don’t always read emails from academic departments, and 72% treat emails from student organizations like spam. Email’s weaknesses can be plainly stated. Students do not use email amongst themselves to communicate. They also have inboxes already spammed by dozens or hundreds promotions and notifications on a daily basis. It’s not a natural place for them to be checking routinely. As universities modernize their technology, other methods of engagement have started to emerge. SMS messages have become a more reliable tool particularly for emergency notifications, but their intrusiveness and 160 character limit means they cannot be used as a method of routine communications. University centers have much to gain through the addition of a push notification channel. Not only will many students prefer it to email, but push notifications can see much higher open rates, see much better analytic capabilities, and in general be moving in the right direction when it comes to the future of student communications. 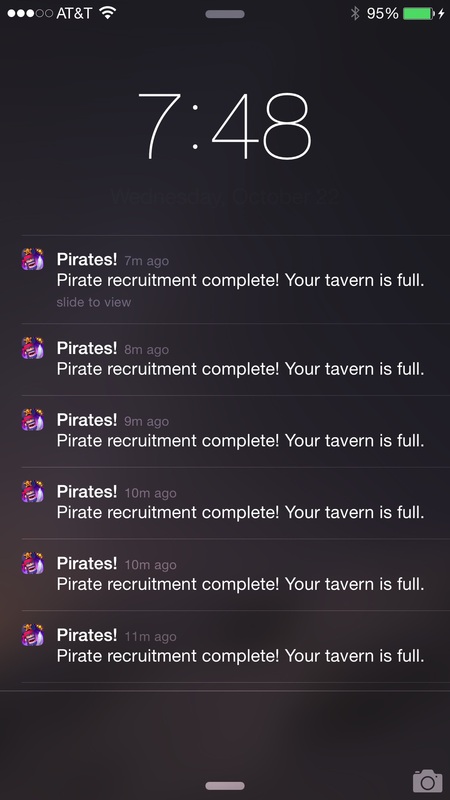 Students becoming annoyed at a single app sending so many notifications, and ultimately uninstalling the app. Students associating your universities’ communications with spam, and unconsciously ignoring and dismissing anything you send. Universities should accept the reality that the most successful engagement campaigns with students in the future will involve a combination of SMS, push notifications, and emails. For push notifications, here are steps to increase the likelihood of a successful campaign strategy. Your team must agree on what kind of content should go through push notification channels. As a general rule of thumb, unimportant communications should go to email, emergency notifications should go to SMS. Every student has a threshold on how many push notifications per week constitutes spam. Go above this limit and risk losing that avenue of communication. Your limit will be different based on your needs and your students, but as a rule of thumb we recommend sticking to 2 or 3 per week. If a notification is relevant only to freshmen, it makes no sense to send it out to the entire student body. 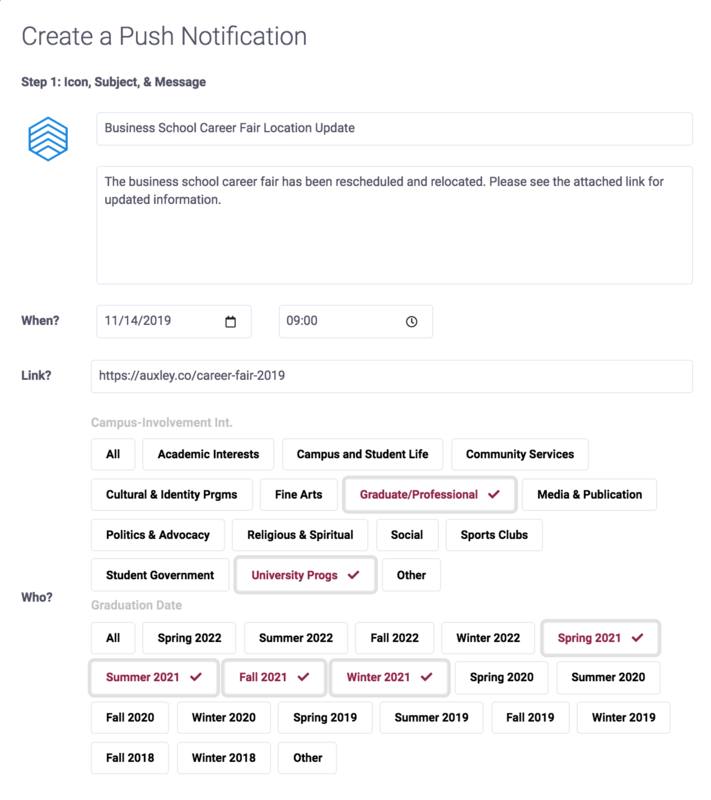 By creating notification groups, you can send notifications filtered to certain specified demographics of the student body. 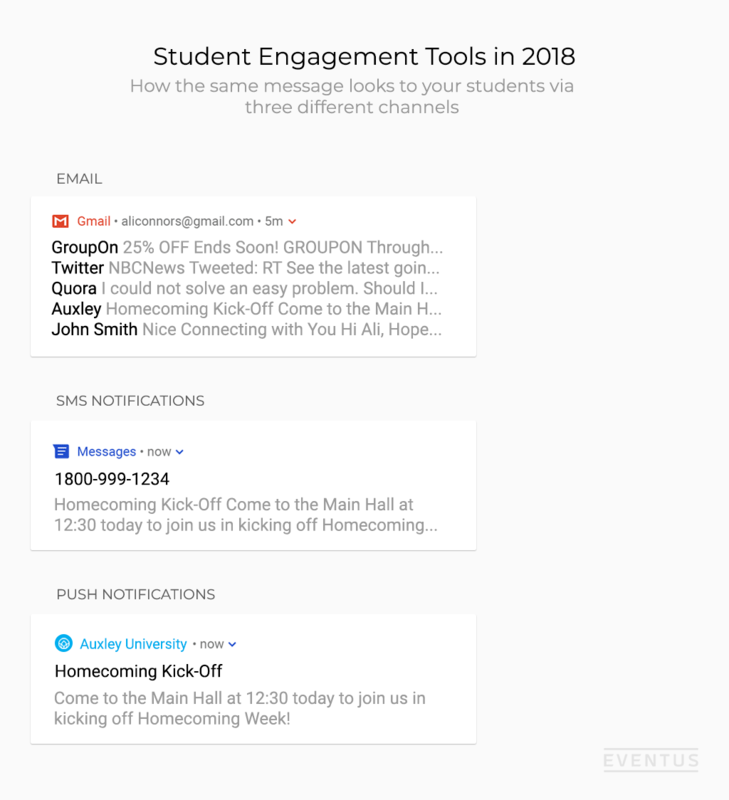 Shameless… but informative plug: You can see how a solution like Eventus can enable you to send notifications only to the students it matters to (below image). An ideal push notification management system will allow you to define segments along multiple dimensions. Some dimensions that are definitely worth creating are: Year, Residence Hall, Demographic, Home Country. Students will take to your notifications more receptively if they know they have the ability to opt out of certain kinds of notifications. 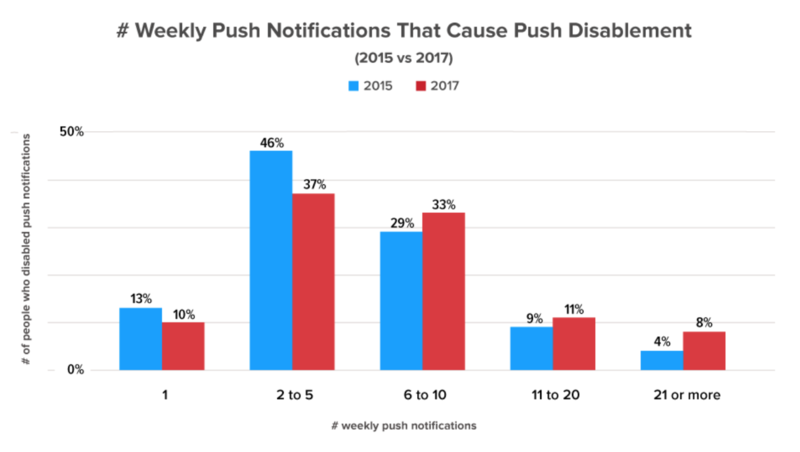 Depending on your setup and solution, it’s likely you won’t be the only group sending out push notifications. Even if your group is sticking to a two notifications per week limit, if another group is sending out two or three a week as well through the same channel, you risk coming across as spam to your students. Eventus is a leading app provider in the FYE and career services space. Having served over a hundred university centers internationally, the Eventus app solution features a single, centralized app for your students to download. You can schedule a demo with us here.